Keep your update short – aim for 5 minutes or less. If you have project objectives, compare progress with these objectives. Provide a 1-page document so that people can take away the key messages. Provide easy-to-understand status indicators – “Red / Amber / Green” (RAG) status for each update item. Project updates are a crucial part of project and product management. Provide some introductory context – remember that everyone’s mind is elsewhere. Avoid going into detail – just give the headlines! If there are any issues, provide some suggested solutions. Show this side-by-side: Targets vs Actual Progress. RAG Status is a good way of highlighting good and bad progress. If you bear bad news, it always pays to have some suggested solutions. Once again – keep it simple. Use a Status Report or Dashboard template (see below). RAG Status: this can be achieved with traffic lights, or dials, or just simply the Red, Amber, Green colours. Dials: While it may seem a bit of a gimmick, dials can be very popular with corporate stakeholders. This Excel dashboard report displays key data from projects in a single page and features dynamic dials which update from data. Automatic Dials! >> view details. This Excel RAID Log and Dashboard Template helps you track detailed Risks, Assumptions, Issues and Dependencies and presents them on a summary Dashboard for easy understanding. Great for Board Reports and Status Reports. >> view details. This Powerpoint Project Dashboard with Status Template is easy to edit. Download it now! The dials & status graphics are simple to change. >> view details. 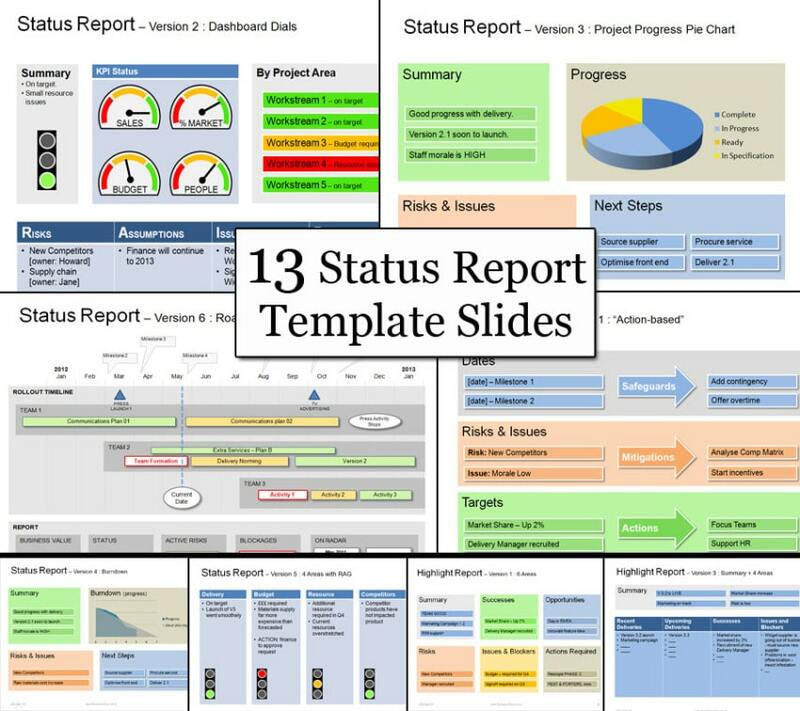 The Powerpoint Project Status Template has 13 Status Templates to help you with all project updates and Executive Board Status Reports. Instant Success. >> view details. This Keynote Status Template a selection of 13 status slide designs to help you communicate your Project and Product updates. Show progress & key messages! >> view details. A dashboard report perfect for updating key stakeholders on projects against delivery, including risk, SWOT, highlights and a roadmap. >> view details. Answer Count: 1 When was the question asked? 2009/11/03 12:14:00 PM By Jeff Armstrong .